After reading “Crossing the Chasm” by Geoffrey A. Moore, I read “Big Bang Disruption: Strategy in the age of Devastating Innovation” by Larry Downes and Paul Nunes. What defines a “Big Bang Disruptor”? – The book mentions three broadly defined characteristics which define a “Big Bang Disruptor”: (1) Undisciplined Strategy (2) Unconstrained Growth and (3) Unencumbered Development. The words “undisciplined”, “unconstrained” and “unencumbered” clearly indicate that Big Bang Disruptors don’t follow the stages of the traditional market adoption model. Forget about the gradual steps from “early adoption” to “market maturity”, it’s very much about entering the market with a big bang (see Fig. 2 below). Four stages of Big Bang disruption – The book talks about the four stages of Big Bang disruption: “Singularity”, “Big Bang”, “Big Crunch” and “Entropy”. The main thing I learned in this respect is the extremely rapid growth and decline patterns which characterises most Big Bang Disruptors. Customer focus – It was interesting to read in “Big Bang Disruption” about the changed role of the customer. Not only is the customer closely involved in product development (“experimentation”), the customer also actively drives marketing rather than the other way around (see Fig. 4 below). 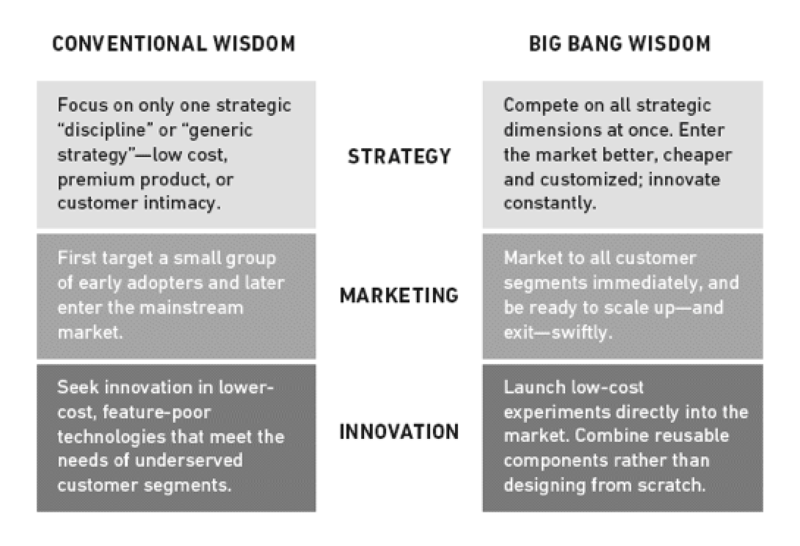 As I highlighted above, Big Bang Disruptors totally disrupt traditional market wisdom (see Fig. 5 below). Main learning point: “Big Bang Disruption” is a great book that will help you to better understand the rapid rise (and decline) of certain companies. The book does a good job in explaining common characteristics of Big Bang Disruptors, showing how traditional market strategies are slowly becoming redundant. Undisciplined Strategy – Undisciplined Strategy means that, rather than concentrating one’s market entry strategy on a specific aspect – operational excellence, product leadership or customised offerings – Big Bang Disruptors will try to compete on all three strategic values at one. They will offer products or services that are both better and cheaper than the incumbents. Unconstrained Growth – As highlighted in Fig. 1 above, the typical growth pattern of a Big Bang Disruptor is nearly vertical, a “winner takes all” model. This is in stark contrast with the more traditional Bell curve whereby growth tends to be more gradual. 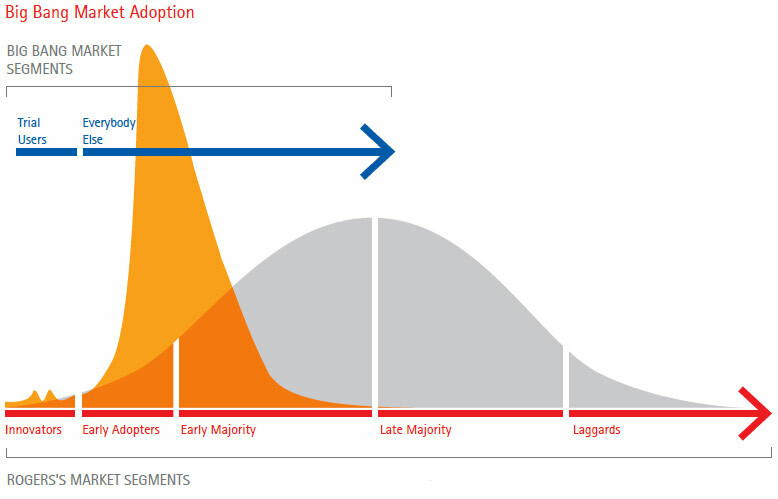 Big Bang Disruptors are typically fast-cycle products that often don’t have “early adopters”. Instead, there are effectively two user groups: “trial users” (who are closely involved in product development) and “everyone else”. Unconstrained Growth comes down to faster growth but also rapid obsolescence, hence the “cliff” like shape of the Big Bang model (see Fig. 1 above). Unencumbered Development – In the book, Downes and Nunes describe a Big Bang Disruptor as “simply an experiment that goes very well”. They explain how the availability of off-the-shelve components enables companies to quickly build and launch a whole range of products, and see which of these products takes hold. The Singularity – The key characteristic of this phase is the amount of failed product experiments which signal the change that’s about to arrive. The Big Bang – Users abandon old products in favour of new products and services. The Big Crunch – This phase signals a quick implosion of Big Bang Disruptors. At this stage, innovation becomes incremental and growth slows. Entropy – This is the last phase of dying industries and the stage is set for the next bunch of disruptors to enter the market. Rule 1. Consult Your Truth-Tellers – Find industry visionaries who see the future more clearly than you do, and who won’t sugarcoat it even when you want them to. Rule 2. Pinpoint Your Market Entry – Learn to separate the little bumps from the Big Bangs,choosing just the perfect moment to enter a new ecosystem. Rule 3. Launch Seemingly Random Market Experiments – Practice combinatorial innovation directly in the market, collaborating with suppliers, customers, and investors – who may be one and the same. Rule 5. Capture Winner-Take-All Markets – Sacrifice everything, including short-term profits, to ensure victory in winner-take-all markets, especially when success with one disruptor can be leveraged into follow-on products that can be created and launched even faster than the original. Rule 6. Create Bullet Time – Judiciously employ litigation and legislation to slow the progress of disruptors, even as you proceed with your own experiments, partnerships, and well-timed acquisitions. Rule 7. Anticipate Saturation – When consumers adopt and then abandon new products and services all at once, it’s essential not to be caught with excess capacity or inventory. You need to anticipate saturation before it happens and to scale down as quickly as you scaled up. Poorly timed purchases – whether of raw materials, inventories, or of companies whose value is about to peak – can wreak havoc with your balance sheet. Rule 8. Shed Assets Before They Become Liabilities – As one generation of disruptors fades, related assets -factories, distribution networks, and intellectual property – can lose value, gradually and then suddenly. Knowing the right time to sell, and to whom, can mean the difference between your ability to develop the next disruptor and bankruptcy. Knowing which assets to keep for the next cycle of innovation is equally important. Rule 9. Quit While You’re Ahead – Even if – especially if – you’ve dominated your industry for decades. The replacement of core technologies with new disruptors can wipe out all your retained earnings quickly if you allow it to. Courageous executives accept the inevitable, and announce their exit from current markets while they are still strong. Doing so gives you more time to move to a new ecosystem. Even better, it forces competitors to change on your schedule. Rule 10. Escape Your Own Black Hole – As the lone remaining incumbent, it may seem as if there’s no more competition to worry about. But beware the deadly behavior of your older products and services once better and cheaper alternatives are readily available. Legacy costs, legacy customers, and legacy regulation make it harder, not easier, to compete. Rule 11. Become Someone Else’s Components – As humbling as the idea may sound, companies trapped in Entropy often find their best hope is to shut down retail business and transform into a supplier of parts and other resources for innovators in markets emerging elsewhere. When you’re losing the war, in other words, become an arms merchant. Rule 12. Move to a New Singularity – Co-opt the tools of the disruptors and their investors, and use them to relocate your remaining assets to a healthier ecosystem. Sponsoring hackathons, opening innovation centers for entrepreneurs, and excelling at corporate venture capital can often buy you the access and equity you need to catch up for lost time and missed opportunities in the early stages. Thanks for this Nice overview! Interesting questions is when to stop the disruptive innovations: for example when is uber or Airbnb not innovative anymore?